I was born on October 21, 1944 in Paris, just before the end of the second world war and a few months after Paris had been liberated by the allies and the French army led by General Charles de Gaulle (August 19–25, 1944). My mother’s name was Lydie Angèle Arcelin and her family came mostly from Normandy. She was born in 1920. My father was Camille André Sauvage and came from the northern part of France. Camille Sauvage was known as a successful jazz musician, both conductor and clarinettist on top of being a composer. Just after the war, he was a popular jazz player and, later on, he composed for French radio, television and movies. When I was a baby, my parents broke up. I stayed with my mother while my father departed to pursue an artist’s life. While I was still a young child, my mother met an officer in the air force, Marcel Louis Grosse, and they founded a family. I was thus fortunate to have a stepfather who took care of me until I became an adult and whose role was truly that of my father. Thus, I always considered him as my real father and I still do. Since my stepfather was in the military and because my parents loved to travel from one place to another, I had a very mobile childhood. When I was three years old, we moved to North Africa, as Algeria and Tunisia were still French colonies at that time. I still have vivid memories of our time in Zarzouna, a small village close to Bizerte in Tunisia. I also spent some time near Oran, in Algeria. I went to school in Tunisia between the ages of 5 and 7. At that time, the French kids and the local Tunisian kids were together in the same classes and I do not believe there were any difficulties related to the fact that the French kids and the Tunisian ones were mingling. My mother and my grandmother, Suzanne Arcelin, were very close to one another and my grandmother, who used to live in Paris, visited our family a few times. On one particular occasion, we went to southern Tunisia for sightseeing and the photo which is shown below is particularly representative. It was taken when I was about 4 years old. Figure 1. 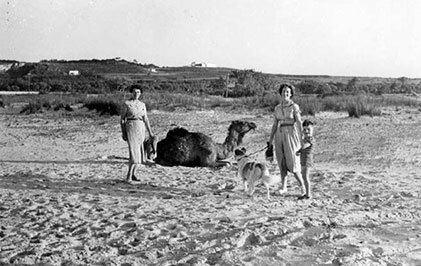 In Tunisia with my mother and, on the left, my grandmother. From 1951 to 1952, my family spent some time in the USA since my stepfather had to become a military engineer in the field of radar applications, a relatively new technology at the beginning of the 50s. We thus spent 6 months in Saint Louis, Missouri, followed by an additional period of 6 months in Denver, Colorado. I had no difficulty in adapting and, in Denver in particular, I used to play with the other children of our neighbourhood. In Saint Louis, we used to go to the movie theatre from time to time and it was of course a very enjoyable event for me. The picture shown below is interesting in the sense that one can see who were the most popular actors of the time. Figure 2. 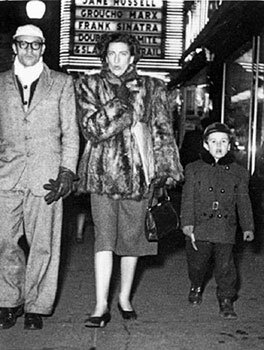 After a movie in Saint Louis (USA) in 1951. When we returned to France, we started a long period of itinerancy, spending a few months in a given place before moving to a new city. I thus went to 4 or 5 different schools in the western part of France and in the Paris area when I was 8 to 10 years old. My mother became ill when I was about 10, and it was a difficult moment for my family. She had contracted tuberculosis, which was a very serious disease in the 50s. I was thus mostly with my grandmother for about a year, in the family village of Pacy-sur-Eure in Normandy. After this period, I was again with my parents, who moved to the eastern part of France in the Lorraine region. When I was 15 years old we moved to a small village in the north of Alsace, Drachenbronn, because my stepfather had been transferred to the radar station located on the Maginot Line named “Base Aérienne 901 Drachenbronn.” This move coincided with the beginning of my high school studies and I thus went to the high school in Haguenau, a middle-size city not far from air base 901. I started to be very interested in chemistry when I was 15 or 16 years old and, in particular, I liked to play with natural molecules such as chlorophylls which I extracted from plants. I had a small and very primitive chemistry lab in the cellar where I was separating chlorophylls on paper or distilling various mixtures. At school, I was probably better in mathematics than in physics or chemistry but the interest of pupils for various topics is obviously very dependent on the personality of the teacher. After my ‘baccalauréat’ (the French examination obtained at the age of 18 which enables one to begin university), I decided to enter a special and highly competitive structure named ‘classes préparatoires’ which was aimed at preparing the young people to compete for admission to engineering schools. Thus, after two years of a rigorous regime where leisure was limited to a strict minimum, I succeeded and I was admitted to the Chemical Engineering School of Strasbourg. This was exactly what I wanted since I could stay in my new but already beloved city. I obtained my engineering diploma in 1967 and started my PhD thesis in 1967 under the guidance of Professor Jean-Marie Lehn. Jean-Marie had founded his own research team a few years before I started to work with him. He was only 5 years older than I and his research team was developing rapidly in terms of size and breadth of his research interests. Being more a physical chemist up until 1967, he had become interested in making new molecules with novel properties when I started with him. At the time Bernard Dietrich, formally a technician, decided to start his studies so as to become a graduate student, hoping also to do a PhD thesis. Bernard rapidly became my best friend and we worked together in the friendliest atmosphere imaginable between 1968 and 1971. Under the guidance of Jean-Marie we were highly successful, since we made the first macrobicyclic compounds able to encapsulate various ions, including alkali and alkaline earth metal cations (cryptands and cryptates for the metal-free compounds and their complexes respectively). In Jean-Marie Lehn’s research group, I was able to acquire a solid background in organic and physical chemistry, thanks to my own work and to various seminars and group meetings as well as to the many hours I used to spend in the library. Discussions with Professor Lehn and with other members of the group were also very fruitful. Equally important was the influence that Jean-Marie had on me in terms of the relationship between researchers within a group. In particular, I enjoyed his way of managing a research team. He was very direct, placing basically no barrier between him and the PhD students or postdocs he was working with. In other words, hierarchy was reduced at its minimum and this is something which I tried to preserve later on in my own group. Inspired by Jean-Marie’s passion for science, I also became enthusiastic and determined to devote my life to research. 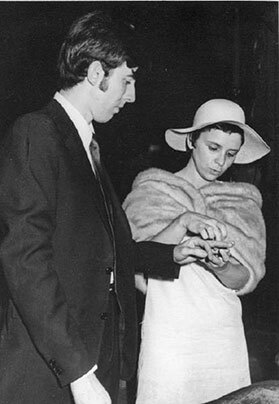 I met my wife Carmen in 1967 and we got married in February 1971. Carmen was a student in History of Art and Archaeology. She was particularly interested in ancient ceramics and had participated in several excavation campaigns on the Anatolian plateau, in Turkey. Although we were not especially religious, we had a religious wedding mostly to respect family traditions (Figure 3). The wedding took place in Thierenbach, a village in the south of Alsace which used to be a place of pilgrimage and which is nowadays famous for its basilica. Figure 3. The wedding ceremony in Thierenbach, February 8, 1971. We were very happy to become parents of a baby boy, Julien Clément Sauvage, on July 13, 1975. It was a great joy for us. Since Julien’s early childhood we have been very close to him. In 2011 Julien married Diana, originally from Colombia, and since 2012 they settled down in San Francisco. They had a baby on April 9, 2016 so that Carmen and I became the happiest grandparents in the world. At the end of my PhD thesis work, I obtained a CNRS position as ‘chargé de recherche’ (research assistant) in Jean-Marie Lehn’s group, which corresponded exactly to what I was so eager to get. After my PhD thesis, I obtained a postdoctoral fellowship in Oxford (UK) where I spent a year in the research group of a very visible organometallic chemist, Dr Malcolm L. H. Green. Malcolm was considered as one of the most brilliant former students of Professor Geoffrey Wilkinson (1973 Nobel Laureate in Chemistry with Professor Ernst Otto Fischer). He was a very influential person in expanding my interests to transition metal chemistry and organometallic chemistry. He was also a friendly person who used to do experimental work by himself from time to time. Life in Oxford was particularly pleasant and we used to enjoy the city, its colleges and its parks. We easily adopted the way of life of the other members of the Oxford community. After my postdoctoral stay in Oxford, I came back to Strasbourg and more precisely to the Lehn laboratory as a permanent researcher. After some work in the field of chiral crown-ethers, Jean-Marie and I initiated a research project in a new field, at least in Strasbourg. It was related to photochemistry and solar energy. The first oil crisis took place in 1973 and it was a clear signal that alternative energies had to be found and that sustainable energies were crucially needed. Solar energy was an obvious and especially attractive option. A particularly appealing project was that of splitting the water molecule to H2 and ½ O2 in order to generate a non-polluting fuel, H2, using photonic energy. Such a big project had already been explored for many years by several groups and there were already discussions and research works published on this general topic in the 50s and later on. More or less at the same time, the ruthenium complex Ru(bipy) 32+ (bipy : 2,2′-bipyridine) was shown to display promising electronic properties in its ground or excited states, in particular in relation to electron transfer and potentially photochemical water splitting. In 1977 we published one of the very first systems leading to photochemical water reduction to H2 based on a combination of species such as in particular Ru(bipy)32+ as a photoactive species and Rh(bipy)33+ as an electron relay leading to H2 formation. After two years of studies on this original system (with Jean-Marie Lehn and Michele Kirch) and related ones as well as on the development of a light-driven oxygen generating system from water (with Jean-Marie Lehn and Raymond Ziessel), I was lucky enough to be promoted to the position of CNRS Research Director, the equivalent of University Professor. I thus founded my own research group in 1980, at first with two highly motivated PhD students, Pascal Marnot and Romain Ruppert. After one or two years, Jean-Paul Collin, a CNRS fellow, and Marc Beley, an Associate Professor, joined our small team. Simultaneously a good friend of mine, Christiane Dietrich-Buchecker, also joined. As it is often the case for young research teams, we tackled several research projects in parallel in relatively remote areas. Electrochemical reduction of CO2 using [Ni cyclam]2+ as an electrocatalyst led to remarkable data since CO2 could be reduced very selectively to CO in water. This was somewhat surprising since H22 was expected to be obtained as a major reduction product. We also did work in homogeneous catalysis and inorganic photochemistry. In this latter field, our projects were mostly triggered by a collaboration with David R. M. McMillin, who was on sabbatical leave in Strasbourg. David was an already well established photochemist and photophysicist. He was a professor at Purdue University (West Lafayette, Indiana, USA) and his main field of research was photochemistry of copper(I) complexes. This collaboration between our group, with its skill in organic synthesis, and David led to a series of particularly interesting photoactive copper complexes. Perhaps even more importantly, it led to a copper(I) complex containing two intertwined organic ligands which appeared to be the ideal precursors to a compound comprising two interlocking rings. It was thus very tempting to jump from inorganic photochemistry to interlocking ring compounds which, at the beginning of the 80s, seemed to be practically inaccessible molecules. This jump was made possible due to the expertise of Christiane Dietrich-Buchecker, who was a great organic chemist. After a few discussions within our team, we decided to take the risk and to embark on a totally new project concerned with the synthesis of catenanes (i.e. interlocking ring compounds). Within a few months, Christiane was able to develop an efficient preparative procedure for making our first catenane (containing 2 interlocking rings). Respectable quantities could be obtained: batches of 0.5g could be prepared, in particular by Jean Weiss, a PhD student also supervised by Christiane, and the first compound was fully characterised using a variety of techniques. 1NMR provided the first convincing evidence that a catenane was indeed produced. These experiments were carried out by Jean-Pierre Kintzinger, a friend of mine and the brother-in-law of Christiane, who was at the same time an NMR expert. We published our first paper in this field in 1983 in an acceptable but not high-impact journal (Tetrahedron Letter). For us it was the beginning of a new era, mostly but not exclusively devoted to interlocking rings compounds and knotted molecules. The field has often been referred to as “Chemical Topology” due to the fact that the compounds have non-planar molecular graphs. In other words, contrary to almost all the molecules known, it is impossible to draw them in a plane (i.e. a sheet of paper) without crossings, regardless of the deformation the molecule can be subjected to. Besides chemical topology and molecular machines, our group has been active in various relatively remote fields. The principal alternative research area has been that of artificial photosynthesis, with a particular emphasis on photoinduced charge separation, one of the key processes of natural or artificial photosynthesis. In order to elaborate efficient models of the natural photosynthetic systems, and in view of realising the complete water splitting cycle in the future, our group synthesised numerous multicomponent complexes, either incorporating metal-complexed porphyrins or second or third row transition metal complexes (Ru, Os, Rh and Ir) able to undergo light-induced charge separation. Following the synthetic work, the photochemical and photophysical properties of most of the compounds were investigated in various places by more physical chemistryoriented research teams than ours. In particular a long-term collaboration with renowned photochemists located in Bologna turned out to be especially pleasant and fruitful (Balzani and his co-workers, University of Bologna, or Flamigni and Barigelletti, Consiglio Nazionale delle Ricerche, Bologna). Some of the charge separated states were shown to be remarkably long-lived, thus paving the way to real artificial photosynthetic devices reminiscent of the photosynthetic apparatus of green plants or photosynthetic bacteria. I would like to stress that encounters with various people played a very important role in my professional life. 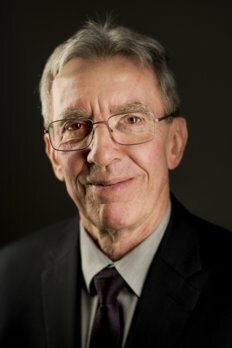 Two teachers were particularly influential when I was a student: Raymond Weiss, who was a very rigorous physical and inorganic chemist, and Guy Ourisson, an exceptional organic chemist who was able to convince all the students he was teaching to that organic chemistry is exciting and can even be fun. Jean-Marie Lehn also had a great impact on my enthusiasm for science and to me he was the perfect model, although this model was totally out of reach. One of the most important encounters was that with Christiane Dietrich-Buchecker, a wonderful person and a great organic chemist whose contribution to the scientific production of our group turned out to be determinant. Finally, it may appear as surprising that Fraser Stoddart and I never looked at each other as competitors. Even more, we both tried to avoid any overlapping with the activities of the other research team. This is mostly because we became friends at the end of the 70s and this was the beginning of a faithful friendship which allowed us to work in a more serene atmosphere than if we had tried to overtake each other. Between 2010 and 2013, I was appointed as visiting professor at Northwestern University, where I collaborated primarily with Fraser and his team. I also enjoyed interacting with other colleagues at this great university. I am particularly grateful to Fraser for arranging for me to get such a position. Figure 4. One of the ceremonies held in Strasbourg (1988) to honour Jean-Marie Lehn’s Nobel Prize (1987). On this special occasion, the chemist community gathered in a friendly atmosphere (as testified by the number of smiley people on the picture). From left to right, the four persons at the front row are Jean-Marie Lehn, Jean-François Biellman, myself and Guy Ourisson. My very good friend Bernard Dietrich (1940–2004), who was also one of the main contributors to the early work on cryptands and cryptates, is at the second row just behind J.-F. Biellman. I would like to conclude with two pictures separated by approximately 29 years. 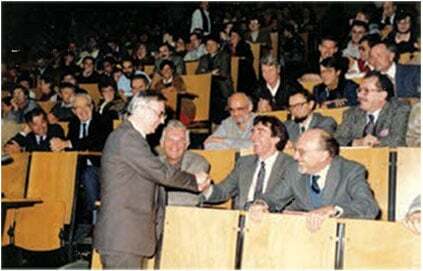 The first one, Figure 4, was taken at the ceremony to honour Jean-Marie Lehn’s Nobel Prize in 1987. This ceremony took place in the Great Lecture Hall of the Chemistry Department of our university. The second picture, Figure 5, is much more recent since it was taken in Stockholm just after the December 10, 2016 ceremony. Figure 5. 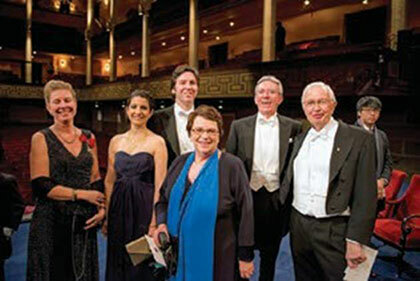 Picture taken on the stage aer the Nobel Ceremony with the Royal Family. From le to right: Annelie Almkvist, our Attachée; Diana Sistiva, our daughter in law; Julien Sauvage, our son; Carmen Sauvage, my wife; myself and Jean-Marie Lehn.